ManaMed Has Always Got You Covered From Prevention To Recovery! BAC Medical Marketing (BACMM), and its division, BAC Medical Ancillary Care (BACMAC) are proud to have forged a strategic partnership with ManaMed, a company whose focus is to drive better clinical outcomes with quality patient care and innovative medical devices. ManaMed is a leading provider of orthopaedic braces, rehabilitation products, and portable vascular therapy. The market leading portable, tubeless, and battery operated portable sequential device. This is the only device that has multiple modalities, verifies pressure, and digitally displays compliance. Lowers Risk of Venous Thromboembolism (VTE): PlasmaFlow lowers incidence of VTE after major orthopedic surgery compared to pharmacological prophylaxis. VTE is the leading factor for hospital readmission following major orthopedic surgery and the most common preventable cause of hospital death. 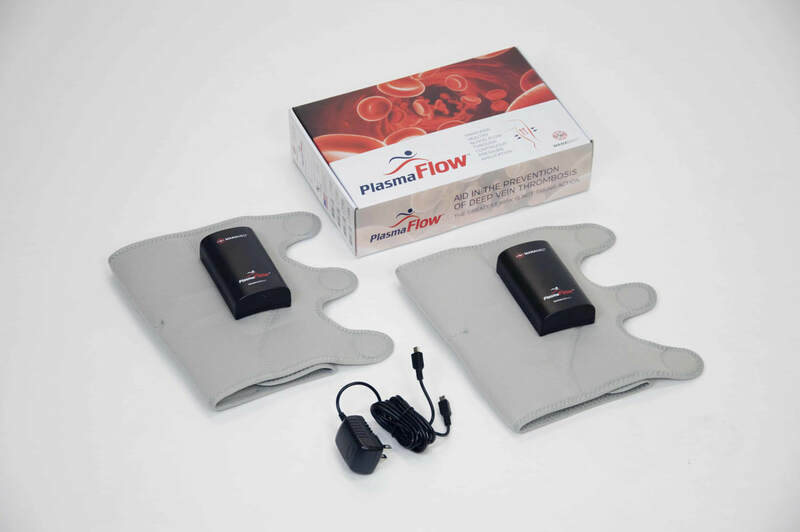 Provides Convenient Home Therapy: As hospital stays continue to shorten, PlasmaFlow provides a solution for patients to take home and keep. This allows facilities to offer mechanical DVT prophylaxis for the 2-3 weeks patients need it most, without the hassle of renting or servicing equipment. Lowers Total Cost: Bundled payment of care initiatives are driving single payment for an orthopedic episode within 30 days of surgery, including costly DVT readmissions. By reducing DVT-related expenses and potentially reducing costs for anticoagulant regimes or compression device rental programs, PlasmaFlow helps reduce the total cost of the episode. Deep vein thrombosis (DVT) refers to the development of blood clots, or thrombi, within a deep vein. Typically it occurs in the thigh or calf and can develop after any major surgery. Symptoms may include pain, swelling and skin discoloration, or no signs at all. DVT risk is greatest between two and five days after surgery, with a second peak risk period occurring about 10 days after surgery—after the patient has been discharged. (1) A consecutive pulmonary embolism, or PE, can occur when a clot breaks free and travels through the veins and lodges in the lungs. PE has been reported to occur in over one third of DVT patients and frequently causes sudden death. The National Center for Health Statistics estimates that DVT is an underlying cause of death for up to 100,000 people annually in the U.S. Estimates place the number of persons affected as high as 900,000. Between 10 and 30 percent will die within one month of diagnosis, and one third will have a recurrence within 10 years. Survivors may have lasting ramifications and chronic respiratory and cardiovascular issues. (3) Without either mechanical or pharmacological prevention, DVT with no obvious symptoms will develop in 40 to 60 percent of patients undergoing total hip and knee arthroplasty. (2) These numbers suggest a very real need for prevention. ManaFlexx & ManaFlexx 2 (the only digital and rechargeable) NMES devices designed for ease of use by eliminating wires or standalone electrodes. These devices are single patient use and are designed for use in the home to treat muscle atrophy due to lack of use or surgery. PDAC approved E0745. Powered muscle stimulators should only be used under medical supervision for adjunctive therapy for the treatment of medical diseases and conditions. The Manaflexx has several advantages over conventional EMS devices. Completely portable no wires or bulky devices. It can be placed anywhere treatment is desired. Reusable simply replace pads and batteries. Doctors prescribe EMS for post-surgical rehab on a regular basis, however it has several applications in everyday Training, Recovery, and Rehabilitation. For training, electrical muscle stimulation with the Manaflexx can provide greater contraction as compared to a normal voluntary contraction, up to 30% higher. Thus more muscles are being used. (i.e. more muscle fiber recruitment). Provides Possible Alternative to Physical Therapy: ManaFlexx offers physicians another avenue for prescribing NMES. Provides Convenient Home Therapy: As hospital stays continue to shorten, physical therapy visits decrease, Manaflexx provides a solution for patients to take home and keep. This allows facilities to offer NMES for up to a month after surgery, without the hassle of renting or servicing equipment. Lowers Total Cost: Bundled payment of care initiatives are driving single payment for an orthopedic episode within 90 days of surgery, including physical therapy. Neither ManaMed or BAC Medical Marketing, nor any of its subsidiaries or divisions dispense medical devices. ManaMed and BAC Medical Marketing provide the information and materials on this site for general information purposes only. You should not rely on the information provided as a substitute for actual professional medical advice, care, or treatment. This website is not designed to and does not provide medical advice, professional diagnosis, opinion, treatment, or services to you or any individual. Please consult your healthcare profession for any information related to treatment, if any, that may be appropriate for you.